So I have been looking at Malifaux for ages, never really got into it because there isn't anyone in my local area that I know that plays it. And all the local stores the store finder says sells Malifaux minis, don't sell them anymore. I bit the bullet and said screw it, I'm going to get into it and try and find people that play. But this leaves me with a bunch of questions as well as options. I'm not a power gamer I don't care if X is underpowered or overpowered I'm more concerned with is it a fun unit or does it play like a sack of bricks. So I'm decided on Resurrectionists or Neverborn. So since it's a new game for me I'm not sure on play style and I'm going to go with things I like the look of and want to paint, and I will learn to like their play style or I will just have some nice centerpiece minis. For Resurrectionists I'm looking at Reva or Tara, but in 3E Tera is changing to be single faction, not an issue as I love her design. 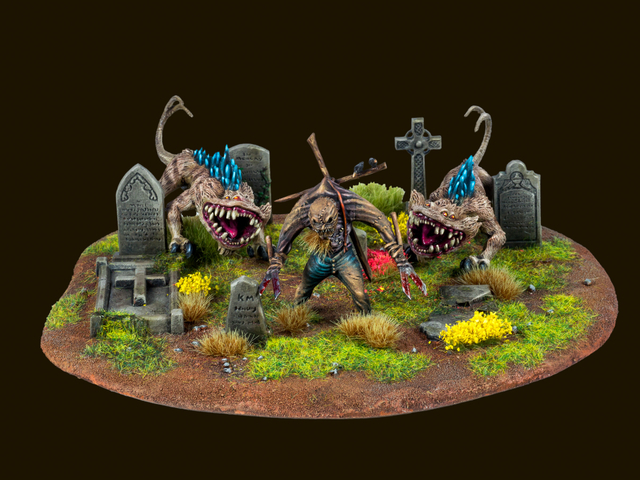 But I'm really curious about the Night Terror minis, do they fit in with either, or do they have a better suited leader? I love bats and I love their design, when I get the money I will be getting a kit to paint at the very least. On the Neverborn side of things Titania is the main one that is of interest to me, but for the specific minis I love the Waldgeist minis and the neverborn emissary, as well as the Amphibious Assault kit, and of course Nekima, both her more exposed and her alt sculpt look like great centerpiece minis. I already got the Avatar version of Pandora because I want to paint it, so maybe starting with Pandora would be an option. So the questions are, should I focus on any one master at the moment? Is 3E coming out soon enough to justify holding back on getting stuff just to get the aged up version? Do night terrors, Waldgrists or the spawn mother and gupps easily fit into any of the starters? Lastly, is there a more up to date store finder? Sorry if this is a lot of questions that have answers elsewhere, I've been reading some of the threads in the Resurrectionist and Neverborn forums but none of them seemed to match my question, as well as my general noob related questions. The only local store, that won't take 2 hours of bus hopping to get to, only really has older Malifaux minis, all the avatars and what I'm assuming are first edition versions of the starters as they look different, so I'm more or less limited to the webstore. Also, no offense meant but the 2E starter doesn't catch my fancy for either faction in it, none of the minis in it really inspire me to want to paint them, compared to say Titania. So here's the situation: I was running a Lilith list against my friend, and I used the Transfixing Gaze spell to push one of his units into hazardous terrain. The ability says that the model in question takes damage if it ends the push in base contact with hazardous or impassable terrain. He argues that this damage is from the terrain and not the spell action, therefore the 1/2/3 flip replaced the 1/2/4 for moving through Hazardous terrain. My arguement is that the spell, as an opposed duel, counts as an attack and is the source of the damage, so both flips would apply. Maybe one of us is wrong? Maybe we both are? Does anyone have an answer? 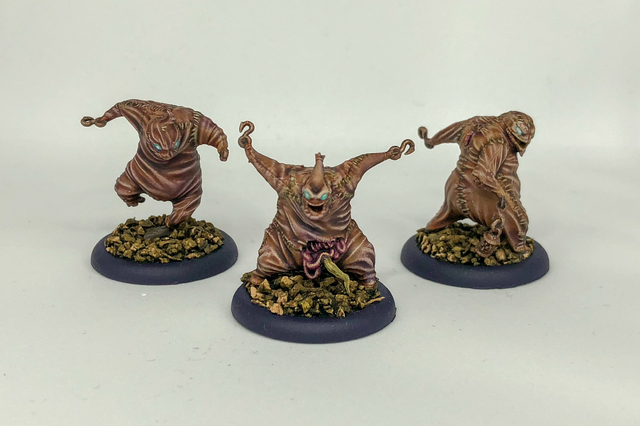 I've recently started painting Malifaux models, and now I've finally finished some! First out, the Judge. I didn't really like the "official" look with a brown leather coat, so I decided to try a red one. It brings my mind to the Spanish Inquisition, English judges' robes and Alucard from "Hellsing". And all those things fits perfectly for a undead-hunting judge. Having the entire cape plain red got a little bit boring though, so I added some freehand to break it up. I also think it makes him look more special. And Captain Dashel. With this model I wanted a more practical and down to earth colour scheme. And I also wanted his colours to repeat on the guardsmen models. And finally two riflemen. They seem to work well with Dashel. I definately wanted some kind of uniform for my guardsmen models. Dark blue seemed like a good colour. Although it is not visible on these photos, the inside of the coat is light brown, to bring some contrast. The only thing I'm not quite sure about is the green pants. I was thinking about making them grey, but then the models would have very little colour on them. And I still like the green pants on Dashel. So...can somebody please tell me how Coppelius would be able to get two rams for this trigger? He’s an enforcer so he can’t use soulstones. Am I missing something? If an ability is only allowed to target a model once per activation, such as Lucius' Issue Command ability, would Lucius be able to Issue command a changeling to use his ability against the same model? Example, in a recent game, Agent 46 was being engaged by Lenny and Lucius activated. Lucius Issued Command onto Agent 46 for him to make a Disengage action. For Lucius' 2nd AP, he issued command onto one of his Changelings who used Just Like You to copy Issue Command and target Agent 46 again. A disagreement came up between me and my opponent and we decided to drop the issue at the moment for the sake of the game. On Issue Command, it says that it may only target a model once per activation, so with Lucius still being the activated model and having other models take actions, would he be able to bypass the targeting restriction on Issue Command? Played an M3e game yesterday between Dreamer and Seamus and we had a few questions/concerns come up. 1. "Once per turn" abilities- Lying in wait on red chapel models states once per turn this model... the rules state "once per" a model... it was a little confusing to us wether or not the ability can be used by every model with the ability or by one model in a crew a turn. If it's one model it's a little underpowered. If its every model it's pretty overpowered. Thoughts? 2. Web markers on widow weaver have almost no information or rules. Do they get removed when she dies? Do they stay forever? 3. Terrifying now works with every action unlike in M2e and now longer causes paralyzed. Can a person just repeatedly attempt to hit terryfing? Does it cause a check during movement? Do you gain immunity after passing once? Do you gain immunity to all models with terrifying? 4. Seamus had an upgrade that made him immune to terrifying. With the way that crews are hired now, by knowing that I was playing dreamer and most of the nightmares have terrifying this upgrade completely neutered my crew. Idk if nightmares are underpowered because of the crew selections or if the upgrade is overpowered but it felt wrong. Thoughts? So I’ve just started this wonderful game - and now I’m finally ready for my first fight. I’ve gone with the Ortegas and tried playing around with still water fix for a swampy theme. Can a leader or henchman save against the sorrows ability or is it unsalable damage? Hello Puppet-Lovers! This is going to be my first attempt at writing a Tactica for use with my favourite Master: Collodi. I used Collodi a lot in the Wave 2 Beta and think I have a good grasp of the tactics and abilities you can make use of in a Collodi crew, which I would like to share with New Players and old alike, as well as maybe give Collodi's Opponents a leg up if they are finding him a difficult Master to go up against in their local group. Let's begin with where we came from: In M1E Collodi's tactics involved spinning a small ball of marionettes into anything and having that thing die rather brutally, from just about anywhere on the board. While maintaining a lot of the same flavour in 2E Collodi is not going to fly across the board with his entire crew, that said he has never felt more like a PuppetMaster in my opinion, and I'd like to show people why, especially if theyre having trouble transitioning. StatBlock First off Collodi is a Low-Wound Master. His Df is average at 5, with good WP at 6. 5Wk makes him a little faster than average, but is going to leave some players missing his old 40" moves. However, he can push 3" after any Df targeting attack, so if youve got some low cards to toss you can attack him with your own models to push him up the board. We've also got Accomplice so he can always have a friend go after him and Puppet Friends, which gives him access to any out of faction Puppet model, which is currently Mannequins, Coryphee and the Effigies. The 6" Bubble Collodi's abilities and buffs all center around a 6" bubble around him. This makes him more vulnerable to blast-heavy crews, but also makes it much easier to buff your entire crew at once. Of note is that Collodi's buffs do not require you to STAY in this bubble. Learning when to venture from the bubble is going to be an important skill for 2e Collodi players. Personal Puppet This is one of Collodi's (0) actions and marks a friendly Minion as the Personal Puppet until he uses the ability again. This grants the PP a (1) action any time Collodi suffers damage from an enemy model while within THE BUBBLE, so long as they take 1 damage themselves. It also grants Collodi the ability to kill (not sacrifice, so it will drop Corpse/Scrap) the Personal Puppet to negate all damage from whatever just hit him. This gives us 2 courses of action with PP. 1) We can throw it on something menacing, like an Illuminated, Young Neph or Ronin, and furiously punish things for hitting Collodi (or stalk the PP closer to priority targets and mark something else PP on out next turn. Nothing says dont hit my Master like a magical crack addict clawing your opponent's Master's face off.) 2) We throw it on something throw away, most notable the Marionette totem, and kill them when a Seamus Flintlock RJ dmg flip appears. The nice thing about the Marionettes is that when they die they may transfer positive conditions off to other minions. So you can face-tank a number of hit equal to your marionettes +1 before taking any damage. Assuming they are all in THE BUBBLE. Ideally you will get a chance to gauge your opponent and pick a tactic that most messes up their gameplan. I usually start off now by putting it on something big unless I guess my opponent is a "kill the master at all costs!!!" kind of player. Beater tends to deter pot shots, chaff tends to deter people from concentrated efforts. Collodi Hates Mind Bullets Ok, so Collodi has Df 5 and WP 6, why does he hate WP duels more? Well, first off you'll only usually only be taking one hit from a Df duel due to the auto-triggered Run Away Home; letting you push 3" in any direction, usually good enough to push out of melee or into cover/out of LoS against shooting attacks. Against WP? He's a sitting duck if the attack makes it past his WP6. So prioritize those nasty WP targets, or just avoid them if you can. But Hates His Opponents More Lets talk about what Collodi does to your Opponent's crew before we get into what he can do for his own. Collodi's lone offensive skill is Pull The Strings. It is highly accurate, extending 4" past THE BUBBLE and best of all, isnt actually a ranged attack, so does not scatter and does not care about cover. The attack itself has a... poor damage profile for a master: 2/3/4, but comes with a positive twist to damage, so you can cheat in those middle of the road cards if you want the 3 damage. But no, where this attack shines is in its triggers. SO first of all we have a build in Mask. That Mask gives the opponent slow. A crow lets us damage AND obey the opponent's non-Leader model, as many times a turn as we have AP and fancy crows to throw at them. The last trigger; Idle Hands, requires a second maske. On that model's activation, you control one of it's AP, and spend it. Now, that on its own is great, but you can shut down nearly any model in the game with 2AP and some good cards. Slapping a model once for slow and then a second time for Idle Hands means they are Paralyzed, without being able to Frozen Heart Immunity their way out of it. They lose 1 AP and you're spending the other. Even models with specific AP like Nekima can be forced to move out of position so they can't make use of their extra AP. Or just stab away with them, your pick. Nasty Ability. Collodi Loves His Children Collodi has two more actions on his -base- card, both of which are for helping his wonderful friends out. Collodi has a deep affinity, like many buffing masters, for Minion and -Keyword- models. His keyword characteristic is of course, Puppets. The first, My Will, allows him to transfer some AP out to his minions/puppets giving them a positive twist to any DUEL they make during the action. So this allows for more easily passed Horror/Manipulative duels, as well as just flatly being more likely to hit. Often you'll be better off attacking with your own strings, but this ability should not be overlooked. It doesnt work on Collodi so dont try. Second, he can summon back his totem, the marionette, or wicked dolls from scrap left lying around from killing all your decoy personal puppets or killing whatever mechanical beasties your opponent brought. This requires a 9 of Masks, making it one of the worst return-on-investment summoning powers in the game. But only by a TN difference of 1 so, its not the end of the world. This ability is one of the reasons you might pause on taking some of the NB minions I mentioned because they will all be dropping corpses, save the Coryphee. But you should have plenty of scrap from marionettes dying and effigies getting taken out. Fated VS Props Collodi's two Limited upgrades are going to change how you're playing with him. Both provide Creep, a handy little 3" push (0) action, good for getting out of engagements and moving up the board. What they differ on is key though: Do you want to Buff Your Crew or do you want to Buff Your Master? Fated was my go-to during the playtest. Effigy buffs are very powerful and will be covered in more detail in their own section. But suffice to say, being able to grant your Puppinions healing on causing damage, burning on every attack unless your opponent discards, etc and being able to do so -without activating Collodi- is very powerful indeed. When Collodi activates he can also grant a second buff to the crew by taking an action. This is usually defensive stance or more notably: Focus. If you have been reading game dev Justin's blog, you'll know how valuable AP is as a resource and I found myself on average granting it to 4-7 Puppinions, which is a heck of a lot of AP saved. Props is the contrast. It allows Collodi to sap off Defensive Stances and Focus conditions from friendlies as required. Now on the surface this seems much less useful, but having Out of Position models ending their turn on a Defensive Stance or Focus can free up a LOT of Collodi's AP, let him stand a higher chance of drawing suits he needs and just generally let him be more effective while chaff models secure you activations and are no less effective at being in your opponents way. If you find yourself thinking Marionettes are not useful, this may be the upgrade to try. Especially with Avatar Collodi's attacks (covered in the third post) You'll also get the option to summon Effigies! You dont get their buff across your whole Puppinion base, but if there's scrap around they can be more useful than a Wicked Doll and Collodi certainly does still get to benefit from the Effigy buffs! I Heard There Are Other Upgrades? Right you are title! My favourite/always taking of the remaining upgrades is Strum The Threads. This allows Puppinions Puppets-Only in THE BUBBLE to take 2 unavoidable damage to gain fast. Now Puppets tend to have low wounds high defences, so if you dont have a way of healing (which you do! See: Effigies) you can quickly wipe yourself off the board, but Illuminated could heal that back same turn. And now they are FAST magical crack addicts. It should be noted this is NOT an action, its just an ability so you cant spread Fast to your Puppinions with Fated. Stop doing so, take your 2 damage like a... man puppet? Like a muppet. Breathe Life exists! Its another option for a (0), letting you toss 2 wounds back on a model, but it can't be you, so probably pass? Pushing Puppinions 2" is actually more useful than it sounds. You can unlock a lot of models from combat or manage some extra distance. If you're hitting 8 models with it, it is 16" of free movement? I dunno, I still haven't got it to be as useful as I think it COULD be. Threads of Fate. Not to be confused with Fated, this makes Collodi immune to forced movement, which is pretty dang super. You also get a (1) to give yourself Armor. Now, aside from the obvious interaction with Fated and giving that armor to your Puppinions, did you consider making yourself Fast with Strum, giving yourself Armor +4 and then not caring so much about the Beatstick in your face? Especially since that 1 minimum damage still lets your PP get free AP. Im sure I can do more with the Collodadillo. Next we'll be discussing Collodi's best pals the doll friends, followed by some Avatar Collodi pondering! So I bought a Doppelganger for my Neverborn crew and its (0) Action ability called Mimic let's you use a 1 AP from another model as if it were printed on its own card. My question is about the trigger for that ability called "Perfect Blend" which states "After succeeding, immediately take the selected action" This confuses me because isnt that what your doing in the first place? What point does the trigger have if your planning on using the ability after Mimic succeeds? Does perfect blend make it a free action? A friend got me into Malifaux about a year ago. Painting is by far my favourite part of the hobby, and I feel like now I've got enough of a stockpile of models and am confident enough in my painting to start showing them off (Please excuse the crummy photos - I don't have anything better than a phone camera...) Here's a group shot of all of my (painted) Neverborn models so far! I'm trying to hold off buying too many new models in the run-up to 3E, so the current project is trying to get them all based. 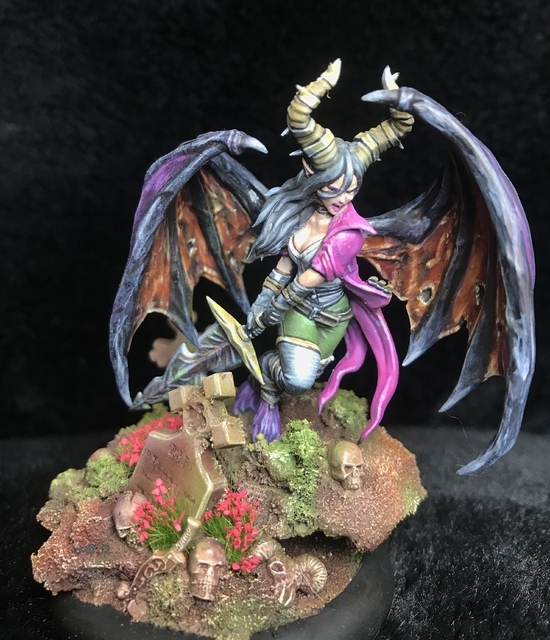 Serena Bowman's my most recent paint job! Shown top next to Dreamer, who was one of my very first painted Malifaux models, and below on her base (sculpted from Milliput). The finished paintjob on Dreamer's base for good measure. I used to think basing was a chore, but the more I do it the more I'm enjoying it I'll be taking more photos of my crews as I get them based, so stay tuned for updates! Hello there! It's been a little while since my last Malifaux battle report, it's been awhile since I recorded a game too. That said, I finally completed a battle report for Malifaux that's been sitting on my to do list for quite a while. The game is a bit older, but I think it turned out interestingly enough to warrant the editing and effects. So check it out if you have about forty minutes to spare =) edit: Fixed the YouTube link. 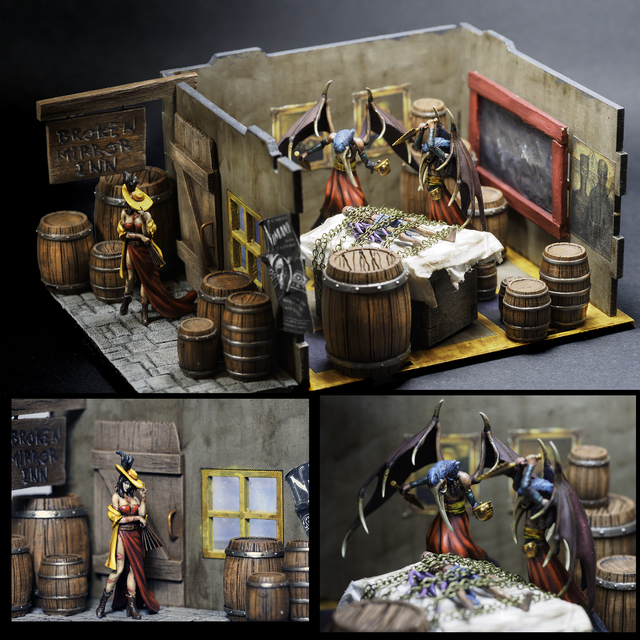 Want to buy The Neverborn Queen Titania Alternate Promo sculpt. Looking for NiB or built unpainted. Thanks! 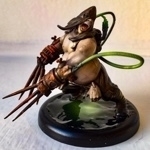 Dear folks, new Malifaux player from Germany here. I have recently purchased my first crew and thought I'd share my minis with the public as I go along. Feedback and criticism are more than welcome, as I am new to miniature painting (this is my sixth miniature total). There you go... Cheers!